Apple Running Top 500 Supercomputer at NAB? Apple Insider got an "inside" look at Apple's NAB setup. They reported that Apple's server included 3/4 Petabytes of storage space, 3 miles of fiber optic cable, 4 M2 Gb networks, 90 Xserves and 40 Xserve RAIDs. Pardon me while I change my pants. 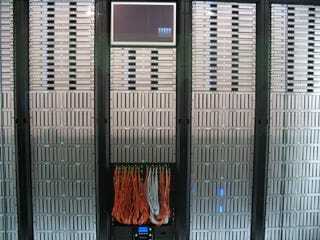 There are systems on the list of the Top 500 Supercomputers with fewer and/or slower processors and slower network connections. Who knows? With a little reconfiguration and optimization for the LINPACK benchmark, maybe, just maybe... Just a little something for you to ruminate on while you marvel at the report's pretty pictures. Hit the jump for more pictures of Apple's ubersetup. Just how important is the professional video market to Apple? You tell me.